I have a little yogurt boy. He politely asks me for it every morning for breakfast and while I grab one out of the fridge, he heads over to the drawer to pick out his spoon. The big decision every morning is what he is going to eat with his yogurt. My mom moved in with us a few weeks ago and what is the one thing she also eats for breakfast? Greek Yogurt. Right now through May 31st you can buy Yoplait Greek 100 — 10 for just $10 – at Publix. Yay! Visit Yoplait and Publix for more details. 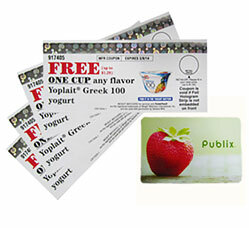 Win 4 vouchers for Free Yoplait Greek 100 and a $25 Publix card! This giveaway will end on May 31, 2012 at midnight EST. Winners will be drawn via rafflecopter. Once a winner is drawn I will contact them and they will have 48 hours to reply before I draw a new winner. Giveaway is open to anyone in US and you must be 18 years of age or older. Giveaway not affiliated with Facebook & I release them of liability. Winner will be posted in the rafflecopter widget. I love Publix and yoplait yogurt. These yogurts are a really good way to get some extra protein in and it tastes like dessert. I haven't tried anything from Cascadian Farms yet. I have bought their products. I like the granola cereals. I have bought regular Yoplait, but haven't tried the new Greek Yogurt yet. No, I have never tried this before but I love yogurt. The Black Cherry sounds delicious. Love the Peach Yoplait Greek 100 Yogurt. I have not had a chance to try the Greek but I always buy Yoplait and am excited about the new Greek 100. I have had Cascadian Farms and love it to! I'd love to try the Yoplait Greek 100. I'm excited to see they have the Key Lime flavor! No i haven't....but i heard they have good products!! I love yogurt—it's always on my shopping list! I like yogurt once in a while, but I don't buy it too often. I am a yogurt person - love it! I love Greek yogurt. Currently I eat chobani. Yes we all love yogurt! Yes, we love yogurt and Publix! I had just decided earlier this morning to start eating yogurt again. Going to go out and get some this weekend. My whole family loves yogurt, especially greek! I try to eat yogurt! I am one if its not in the house, I want it but once its here I dont eat it! Everyone in my family (except me) Loves Yogurt. We are huge yogurt eaters here. There's always at least one large and several small containers in our refrigerator! yes, I eat yogurt every other day! I love yogurt I could eat it every day! I haven't tried Yoplait Greek Yogurt yet, thanks for the giveaway. Yes we are such a yogurt family! can never get enough! We love yogurt at our house. Yogurt makes an easy snack! Yogurt is great for a meal or a smack. Yes, we love yogurt cant wait to try these! I do not eat it, it's a texture thing. My kids, on the other hand, can eat their weight in the stuff! We eat alot of Greek yogurt around here! I love to eat greek yogurt with fruit and make dips with plain greek yogurt. Yes we are. I eat yogurt every day. we are a yogurt family! We love frozen yogurt the best. Yes! I always have greek yogurt stocked in the fridge Thank you for the great giveaway! Everyone in my family loves yogurt, especially Greek yogurt! Yes, we eat yogurt regularly! My Teenage daughter is a yogurt-a-holic. Yes! We go through a lot of yogurt in our house!